Properly-frothed milk is the difference between an “ok” cup of coffee and a barista-grade, delicious latte or cappuccino. Luckily, you can froth your own milk at home – all you need is a cheap piece of equipment. After testing out 29 different models, we’ve settled on a list of the 5 best milk frothers available to you today. Do you enjoy drinking a latte or cappuccino in the morning before work? While your local coffee shop can whip this up for you, you can actually make the same, frothy cup o’ Joe yourself at home. All you need is a cheap handheld milk frother to get the job done. Milk frothers basically aerate your milk, adding tiny pockets of air via whisking. This transforms the milk into that satisfyingly frothy goodness that enhances your cappuccino or latte. To help you in your pursuit of barista-grade frothing, we’ve rounded up the best handheld milk frothers that you can get your hands on in 2019. Afterward our top 5 list we’ll also be taking a quick look at the basics of this coffee preparation equipment to help further understand how frothers work and how you should use them. Quiet and sufficiently powerful motor. Cordless design, requires 2 AA batteries. The included coffee filter extra can be a bit finnicky. Once you have decided to level up your popcorn toaster to an actual coffee bean roaster then the Fresh Roast SR500 is one of the best choices available to you. Not only does it produce quality roasted coffee bean, the SR500 is a lightweight and affordable coffee roaster that will not break the bank. This is a highly recommended coffee roaster for beginners. It is an air roaster and utilizes convection heating to prepare your coffee beans. The compact nature of the roaster also means it won’t take up much space in your kitchen. I also found the Fresh Roast SR500 to be extremely quiet, one of the quietest coffee roasters, in fact. The fast and powerful motor can deliver frothy results in under 17 seconds. Comes with a free e-book. The PowerLix Milk Frother is another reasonably priced electric handheld milk foam maker that should provide you with what you need in your morning beverage. This is a battery powered foam maker that can deliver up to 19,000 rpm for lightning fast milk foaming. The handle is non-slip and the device uses an ergonomic design that makes it easy and comfortable to handle. Operating the device is also incredibly easy. You can turn the frother on with a touch of a button located neatly above the handle. The PowerLix MilkPro is something that you should check out if you are looking for a budget-friendly milk foam maker. Silicone handles offer better grip and durability. The motor is extremely quiet. Again, this is not dishwasher safe. However, it is easy enough to clean by hand. Another highly recommended milk foam maker I have come a crossed is the Bean Envy Milk Frother. This unit is made from durable 304 stainless steel and provides 19,000 rpm to produce desired foam in a flash. The button is located at the top of the handles make it simple and easy to operate. The ergonomic design of the unit also means you won’t be straining your wrist when using it to whip up a delicious and foamy cup of your favorite morning drink. The handles are made from silicone rubber which provides enhanced shock-absorption and better grip. The unit also comes with its own stand so you can pretty much place/store it anywhere in your kitchen. There have been complaints about the quality of the motor. Simple and easy to use with a no-frills design, the Elementi Milk Frother delivers the froth in a matter of seconds. The motor can deliver the standard 19,000 rpm power to create desired foam within 20 seconds. 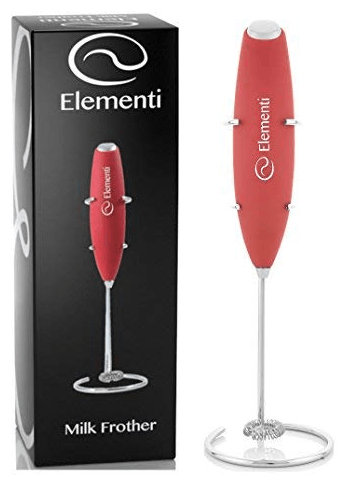 As for construction, Elementi utilizes whisks made from durable stainless steel. The unit is also coated with a rust-proof finish to provide longevity in spades. The unit also comes with a stand and the bright red color template definitely adds to its aesthetics. Stainless steel construction and design. Deluxe model is a bit more expensive. The Aerolatte is another easy to use handheld milk foam maker for coffee aficionados out there. It can be used on both hot and cold milk and produce equal froth on both. 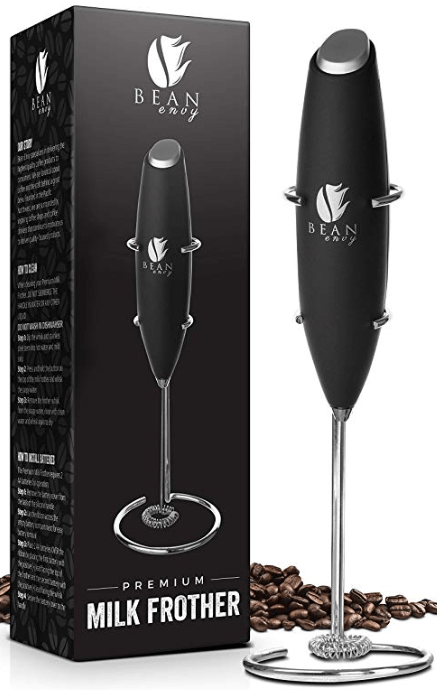 It features a stainless-steel whisk that is built to last and a user-friendly one hand operation. The motor is powerful enough to produce the desired foam within 20 seconds. It is also relatively quiet. It is slightly more expensive than others in this list and has its fair share of complaints. Based on my personal experience though, this one is pretty solid milk foam maker that you also might want to check out. If this is your first time trying out a handheld milk frother then there are several factors you need to consider in order to ensure you produce the best quality foam possible. Here is a quick guide on how to optimize your use of a milk foam maker. For best results, try heating up your milk a bit, to at least 95 degrees Fahrenheit. You can use a microwave to easily accomplish this. You should position the whisk or wand at the bottom of your cup of milk. Make sure the cup is slightly angled. Start whisking the milk until you get the desired level of froth. Now, remove the wand carefully and vertically. This should help increase froth as you remove the frother from the cup of milk. Pretty simple, right? With practice, you can make a deliciously frothy cup of coffee similar to the ones found in your favorite coffee shops. Why Use A Milk Frother? Milk frothers help enhance the experience of drinking your favorite coffee, cappuccino, latte, etc. For coffee aficionados such as myself, I sometimes crave for that lush foamy goodness in my morning beverage. Now, there is no need to head onto your local coffee shop to get your frothy fix, with the help of a handheld milk frother, you can create your very own right in the comfort of your own home!